TSPSC Staff Nurse Results, Certificates verification Dates 2018, List of documents(TS Gurukulams): TSPSC Staff Nurse Ranking list Merit list Results announced. 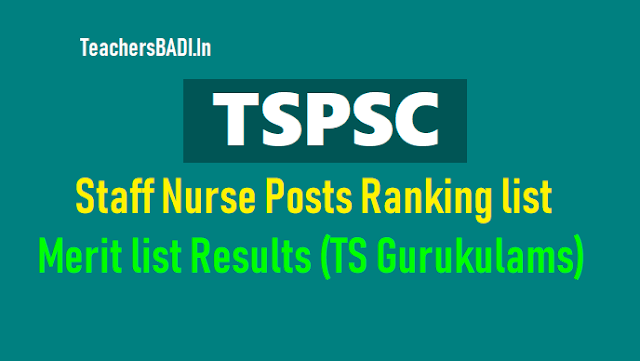 TSPSC Gurukulam Staff Nurses Recruitment Results/ TSPSC Gurukulams Staff Nurses Recruitment Merit List Results 2017/TSPSC Staff Nurses Recruitment 2017 Ranking List Results. TSPSC released the Staff Nurses Recruitment 2017(Notification No.21/2017) on 13/04/2017 for filling up the Gurukulams Staff Nurse posts/ Gurukulam staff nurse posts under various Residential Educational Institutions Societies (TSWREIS, TREIS, MJPTBCWREIS, TTWREIS, TMREIS) in Telangana State. Online applications were invited from the eligible and interested candidates for the recruitment of Gurukulams Staff Nurse Posts in Telangana REISs from 20-04-2017 to 09-05-2017 through Online mode at TSPSC Website. Some of the candidates who have attended for Certificate Verification for 1st Spell from 04/07/2018 to 07/07/2018 and 2nd Spell on 14/08/2017 for the post of Staff Nurse have represented that they have committed mistakes in exercising web options and some candidates have not at all exercised web options. As such all the candidates who attended for certificate verification for 1st and 2nd Spell are hereby permitted to edit their Web Options / Post Preferences for the various Societies and Zonal preferences to the said posts on 22/08/2018 and 23/08/2018. All the candidates are instructed to note that failure to exercise web options/ post preferences for jobs will result in not being selected for any post. Further, candidates are requested to exercise web options carefully as insufficient web options can result in not being selected, though vacancies may be available. Hence it is advised that as many options as possible be exercised in order of preference. This is the only opportunity to edit web options. The web options /post preferences now submitted cannot be changed under any circumstances. Note:. Only such candidates who wish to make changes may use the edit option provided for two days i.e., 22/08/2018 and 23/08/2018. Result Notification for the post of Staff Nurse (Notfn.No.21/2017): On the basis of Written Examination held on 17/09/2017 for the Post of STAFF NURSE Notification No.21/2017 in various Residential Educational Institutions Societies, 1019 candidates are provisionally picked up in the ratio of 1:2 for Certificate Verification scheduled to be held from 04/07/2018 onwards and the Venue & Day-wise schedule will be hosted on Commission’s Website shortly. Please visit Commission’s website www.tspsc.gov.in for Result and further details. On the basis of Written Examination held on 17/09/2017 for the Post of Staff Nurse vide Notfn. No.21/2017 in various Residential Educational Institutions Societies, 1019 candidates with the following Hall Ticket Numbers are provisionally picked up in the ratio of 1:2 for Certificate Verification against total number of 533 vacancies. The Certificate Verification is scheduled to be held from 04/07/2018 onwards. The venue & Daywise schedule will be hosted on the Commission’s Website shortly. The candidates who are called for Verification of Certificates have to produce the following certificates in original along with a set of Photostat copies duly attested by Gazzetted Officer at the time of Verification of Certificates, failing which, they will NOT be admitted in subsequent process of selection. No request will be entertained for subsequent submission of any of the required certificates. In terms of the Notification, the candidates should possess the requisite qualifications as on the date of the Notification. The Commission reserves right to disqualify any candidate, if he/she is not found eligible for any reason at any stage. Admission to Verification of Certificates does not confer ipso facto any right for Final selection.